Where we live impacts every aspect of our lives. Where we call home affects the groceries we buy, where we send our kids to school, and how we thrive in our community. At every stage of life, where we live is the foundation for our health, education, safety, and economic wellbeing. But in communities across the state, there isn’t enough affordable housing. This leaves few options for Minnesotans struggling to make ends meet. 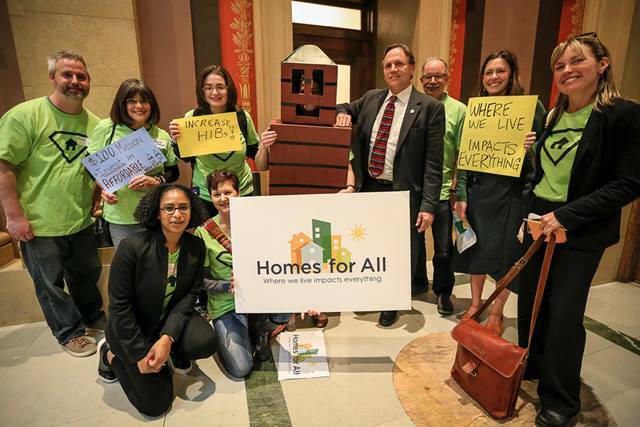 In 2011, advocates across Minnesota came together to create Homes for All — a statewide coalition that advances shared policy initiatives at the state level that lead to housing stability for all Minnesotans. With significant successes at the state legislature, the coalition has grown to more than 240 endorsing organizations across the state representing nonprofits, service providers, affordable housing developers, faith groups, government agencies and more. Download the map of our endorsing organizations! 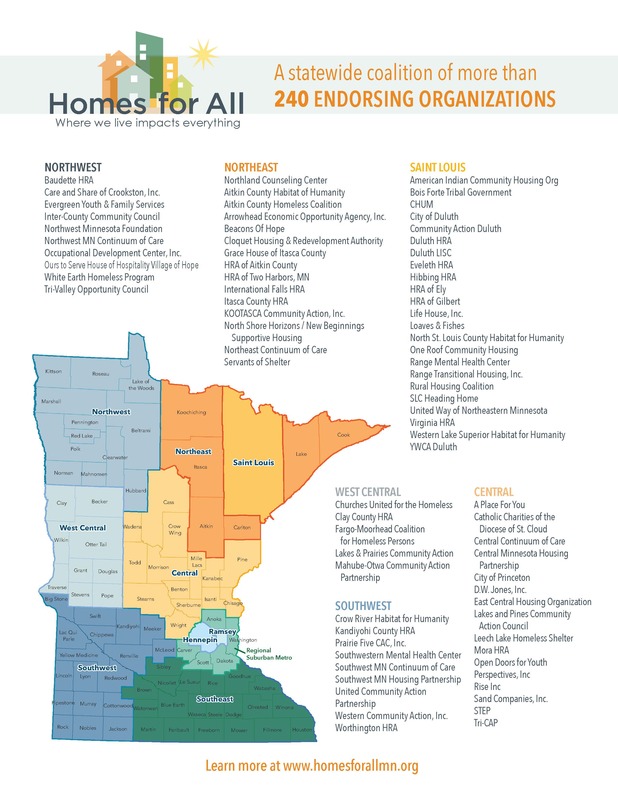 Homes for All recognizes that there isn’t one kind of housing that fits the needs of every Minnesotan. That why we work to maintain and increase statewide investments across Minnesota’s Housing Continuum — from preventing homelessness to producing affordable rental homes to preparing homebuyers. Each year during the state legislative session, the Homes for All Coalition advocates for a shared agenda, which includes priorities and policies put forward by and voted on by the endorsing organizations. Learn more about our 2019/2020 agenda here! We need your voice to achieve Homes for All!